Although many people believe “It’s not what you know, it’s who you know,” which is one of the main reasons why LinkedIn is so valuable, many folks (recruiters, hiring managers, CEOs, investors, and more) are very interested in what you know. Logically, the people who know you best are the people in your network, who have observed your work firsthand and can speak to the quality and degree of your skill set. LinkedIn came up with an easier way for users to identify what skills they think their contacts have, and this system is called LinkedIn Endorsements. Endorsements are an easier way to recognize someone’s skill set. While a recommendation can be a thorough and positive review of someone’s job, endorsing a particular skill can show the community very quickly what skills someone possesses. Endorsements are a great way for you to highlight important skills. When you’re looking for a job or thinking about your career, having your key skill set show up as endorsements on your profile signals to recruiters and hiring managers that not only do you have the skills to do that job, but other people believe in your skills enough to endorse you. Just like with recommendations, people are more likely to believe other people’s testimony about your skills than your own assertions. Endorsements are independent of any specific position. When you write a recommendation for someone on LinkedIn, it is tied to one position. When you endorse someone’s skill, it’s tied to that person’s entire profile, not just one job that was held any number of years ago. Because of the ease and speed of endorsing someone’s skills, coupled with the fact that LinkedIn offers lots of prompts for you to endorse people’s skills, there is a very real trap you need to avoid: blindly endorsing skills the other person may not possess (and others endorsing skills of yours they can’t verify you possess). It’s important that your endorsements are authentic, so put some thought into giving and managing your endorsements. Each LinkedIn user can have up to 50 skills that can be endorsed by his network, and the top 10 endorsed skills appear on the person’s profile page, under the Skills & Endorsements section. The profile pictures of the people who endorsed those skills appear to the right of each skill. While many of the skills that appear on the Endorsements list come from what you entered as your skills and experience on your profile, your contacts can add skills you may not have identified yet. 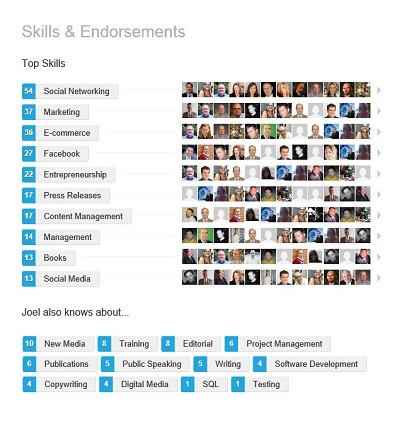 LinkedIn Skills & Endorsements show your network’s beliefs in your skill set.